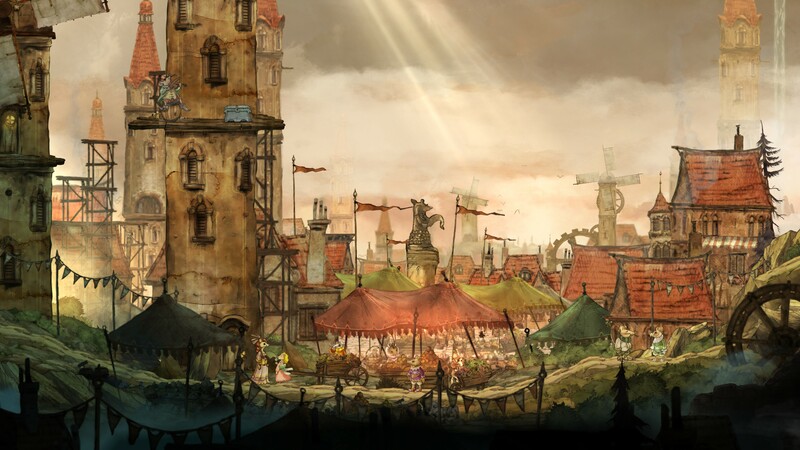 Child of Light is a whimsical, yet somewhat dark RPG/platformer game that takes heavy influence from story book fairy tales. The world has a magical charm to it, and takes a somewhat interesting spin on your traditional RPG. 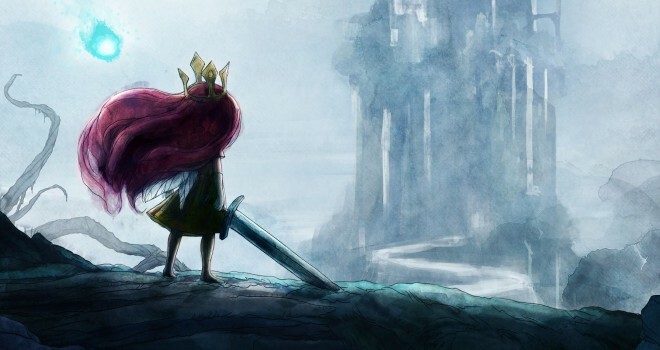 Child of Light was developed by Ubisoft for a multitude of platforms, but bare in mind, my experiences came from the Wii U version of the game. I’ll be sure to keep the spoilers to a minimum. With the intro out of the way, let’s dive into a mystical land of wonder, magic, and turn based goodness. 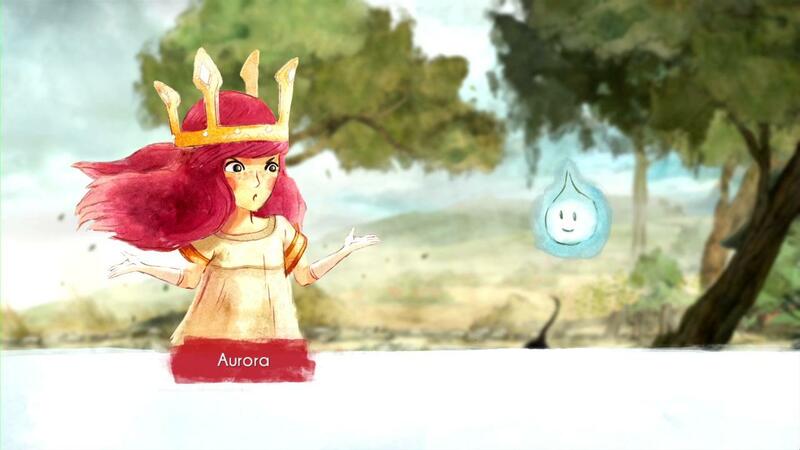 Child of Light stars Aurora, a young princess who wakes up and finds herself in the mythical land of Lemuria where she meets a firefly by the name of, Igniculus. Together, they set out to return Aurora to her father and save Lemuria from the evil Umbra Queen who has stolen the sun, the moon, and the stars. Along the way, they meet plenty of friends to help them in their journey. These friends become the players’ party members. The story has good pacing and everyone speaks in rhyme…yes, the entire time (see what I did there?). This fits very well with the whole storybook theme. As Aurora and her allies venture the land of Lemuria, they travel through the land, air, and sea, while battling many dark creatures who serve the Umbra Queen, all while trying to take the sun, moon, and stars back from her. 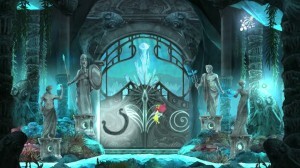 Throughout the story, the player encounters a number of different races, and will end up helping those who have been affected by the evil queen. 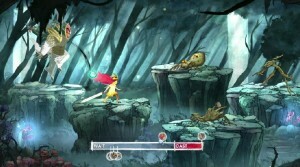 Each character has their own interesting back-story and reason for fighting. The personality of each character is very defined. However, there was something a bit off. I can’t really put my finger on it. I just didn’t feel a strong connection with the characters…at least not as much as I should have. In such a story driven game, I feel like I should be very invested in the characters the whole way through, but I didn’t feel completely invested in them until around chapter 8. Don’t get me wrong I still cared, but when I think back to other RPG’s like Chrono Trigger or Earthbound, I cared a lot more about the people (and animals) I met in my travels. There was just some kind of minor disconnect for me this time around. All in all, the characters were written very well, but I feel the execution fell just a tiny bit flat. Like I stated before, the pacing of the story was well done…up until the end. At the end of chapter 8 something really big happens that suggests that the climax is approaching. The excitement builds up and then chapter 9 comes along and drops it. Things don’t get exciting again until the end of chapter 10. Then after chapter 10, the last cutscene is shown and it feels unsatisfying and rushed. It all made for a very weak and somewhat head-scratching climax and resolution. 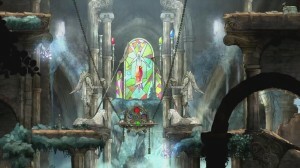 One of the developers even stated that there was another level towards the end that was scrapped. This may explain things a little. I found that the rest of the story however, is very well thought out and flows naturally. It starts out strong, continues that momentum, and then decreases almost instantly towards the end. It reminds me of Legend of Korra (too soon?). Now let’s talk about the meat and potatoes. The gameplay is very fun. 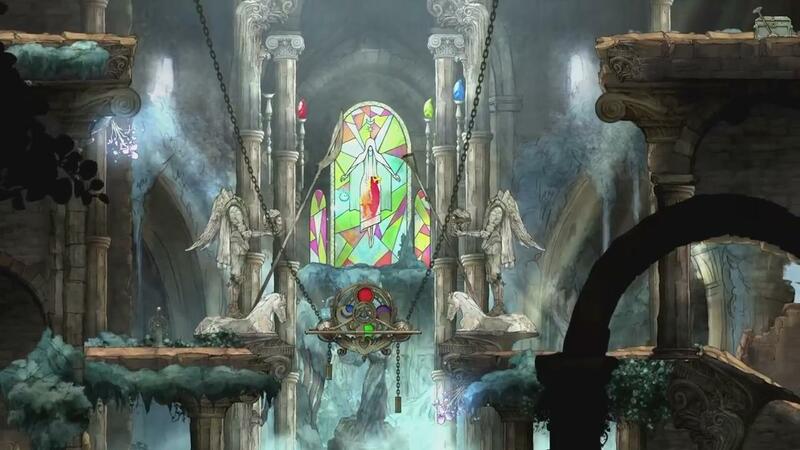 I liked how they threw in puzzle elements in the platforming sections. 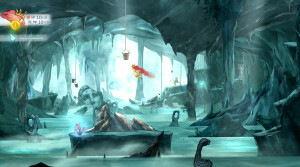 Traversing around Lemuria is a breeze as you control Aurora and fly freely. You can also control Igniuclus with the right analog stick and use his light to open certain chests, and trigger switches. The amount of light he has remaining is indicated buy the blue gauge on the left. His light can be replenished by collecting wishes. Wishes can be found from the plants at the bottom. If you collect the wishes in the right order, HP and MP for Aurora can be replenished as well. The battle system is somewhat like your standard turn based RPG, but with slight twists. The player may only have up to two party members on their side at a time. The enemies can go up to three. It consists of most things you would expect. You have HP, MP, speed, defense, healing items, etc. But, there’s also the timeline. The character will attack once their icon reaches the end of the timeline. Once they reach the casting point, their speed will vary depending on the move they chose to use. If a character is hit while casting, they are “interrupted” and set back through the timeline. This can be avoided by defending. If the player defends, they start at the beginning of the timeline, but they move significantly faster and avoid being interrupted. 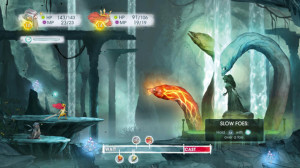 The player can also use Igniculus’ light to slow down enemies or heal allies. This makes for some interesting strategies as you try to get the timing down just right, and make sure Igniculus has enough energy. The fights are relatively easy until the end. Even then they’re still pretty easy for an experienced gamer. I didn’t die once, though I came close a couple times. Child of Light is a lot more forgiving than most RPG’s. For example, when switching out a party member, the player may do so as soon as they reach the casting line to choose an action. Once they switch out, they can then tell the replacement party member what to do immediately. Usually, switching out a party member would count as a turn, but not in this case. Also, the fact that you can use Igniculus to slow down enemies or heal almost anytime you want, definitely makes for a slightly less stressful time. There are also elemental advantages in the game. There’s light, dark, earth, fire, lightning and water. Light beats dark. Fire beats earth. Lightning beats water. Water beats fire. Using this knowledge will definitely help in battle and it’s pretty easy to distinguish what types of enemies you’re fighting. Let it be known that not every enemy has a specific typing. 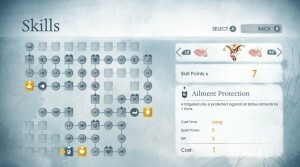 When leveling up, the player is granted skill points. 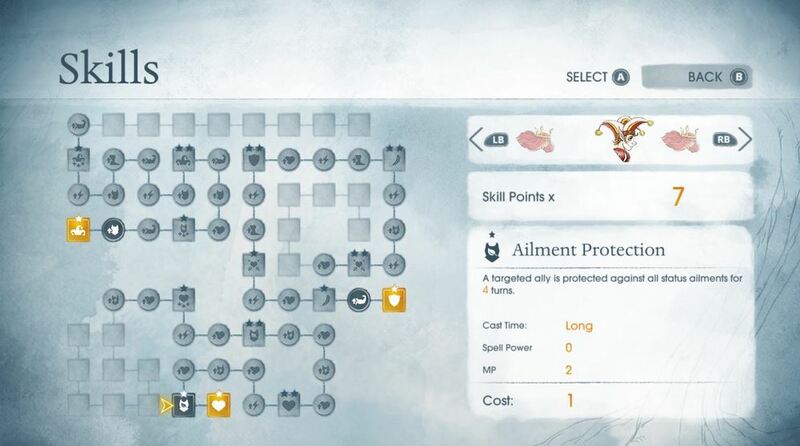 These skill points let you increase stats and add abilities to each character. Unlike most games where these things are determined for you, the player can go across the board and choose how they would like to build to each individual party member. 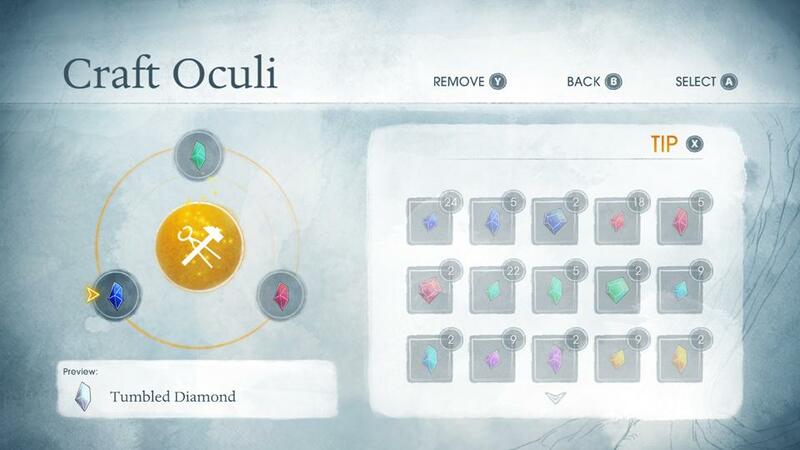 Oculi are another way to increase stats to a character. Some even add different elements to attacks. There are a lot of different Oculi including, rubies, sapphires, emeralds, diamonds, onyx, and more. Oculi are found throughout the game, and even stronger Oculi can be crafted by combining them. Try out different combinations to see what you get. I actually wasn’t a huge fan of this system. It wasn’t that I didn’t think the idea was cool, but working through the menu was a real pain. Some Oculi have different effects on certain characters than they do for others, and I found myself constantly going back and forth through party members and different Oculi. By the end, I had so many allies and Oculi that I barely even cared about equipping them anymore. It’s still a nice concept though. It just could have been done better. Overall, the gameplay is pretty outstanding. It’s accessible enough for casual gamers to jump into, yet there’s enough strategy and customization involved for hardcores to not get bored. My only complaint was that the fights with common enemies began to get a tad bit repetitive. This feeling of repetition doesn’t last very long luckily. There are always new party members and enemies to spice things up before you know it. Overall, Child of Light is a great game, but it is definitely not without its flaws. The story is good, not great. The character development is just okay. But, I think the gameplay is solid, the music is fantastic, and the visuals are immersive. To me the game is a little bit overrated, but that doesn’t mean it’s bad. It’s actually far from it. If you haven’t had a chance to pick it up yet, I definitely recommend you try it out. It’s a short game, but fortunately, there are some side missions you can complete if you haven’t had your fill.